People have been calling the police. 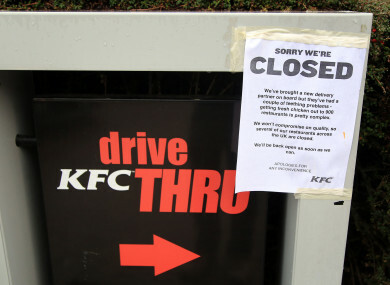 SOME KFC OUTLETS in Britain are to remain shut for the rest of the week, the fast-food operator said as a supply crisis rumbled on, leaving fans craving a fix of deep-fried chicken. About 450 of the chain’s 900 outlets remained closed late Tuesday after “operational issues” with new German delivery supplier DHL left them without poultry supplies. “Each day more deliveries are being made,” said a spokesman for KFC. The crisis erupted over the weekend when KFC switched its delivery contract to DHL, leading to the closure of 700 of its British stores. “We’ve brought a new delivery partner onboard, but they’ve had a couple of teething problems — getting fresh chicken out to 900 restaurants across the country is pretty complex,” KFC said. “We know that this might have inconvenienced some of you over the last few days, and disappointed you when you wanted your fried chicken fix,” the company added. DHL’s managing director of retail, John Boulter, said the delivery firm was working to “return to normal service levels as soon as possible. “The reasons for this unforeseen interruption of this complex service are being worked on,” he added, although did not give the exact reason for the problem. Email “The UK could be without many KFC restaurants all week”. Feedback on “The UK could be without many KFC restaurants all week”.